I have to admit that prior to being sent a set of RHA MA650 wireless earbuds for a review, I hadn’t heard of the Scottish audio company. And I suspect that’s true of many people. It’s a shame, because as I soon discovered, RHA makes some very good headphones. The RHA MA650 wireless earbuds make an excellent first impression. Attractively packaged, they arrive with a generous selection of ear tips in various sizes, form factors and materials –including Comply Foam tips– mounted on a stainless steel card for easy access. Also included are a USB-C charge cable and a cloth mesh carrying pouch. 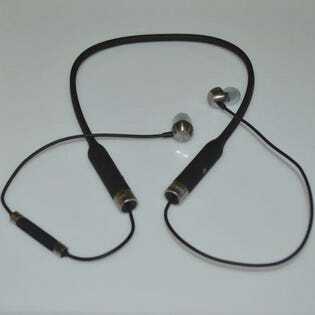 The earbuds themselves consist of brushed aluminum buds connected to a black silicone neckband with brushed metal accents and an inline remote. The look is premium. The cables and neckband are soft, flexible and comfortable. The buds themselves connect magnetically to create a closed necklace when not in use. Rated IPX4 water resistant, the MA650s are sweatproof and should be fine if you wear them running and get caught in a rain shower. RHA also stands behind its products. While most earbuds carry one year of coverage, RHA backs the MA650s for three years. As always, getting a good seal is key to audio performance with earbuds. RHA includes a nice selection of silicone ear tips (including several flanged options) and a pair of Comply foam tips. Getting a decent fit shouldn’t be much of a problem. The earbuds themselves are made of brushed aluminum. They’re light and small enough to not be a distraction, although I did find the small size and smooth shell made it a little more difficult than usual to get them properly positioned. I have large fingers and also usually have some difficulty getting any earbuds to fit properly, so you may not have the same issue. The neckband is made of a soft, flexible material (it feels like silicone) and this is where most of the weight is. It sits comfortably in place and I soon forgot it was there –at least so long as I remained upright. Lie down or lean back and the weight means it quickly slips down your back and can tug the buds out. The big surprise during testing was battery life. Audio manufacturers typically publish numbers on the high end, prefacing that with an “up to” disclaimer. RHA says the MA650s are good for up to 12 hours on a charge, which is pretty good for wireless earbuds (and blows away the single digit numbers you’ll get with true wireless buds). However, in testing I was regularly hitting 14 hours, despite having the buds at 50% volume or higher. The buds offer a vocal battery level estimate (with 20% increments) plus an LED indicator, and fully charge in about two hours. The RHA MA650 earbuds look good, but I wasn’t expecting a whole lot in terms of audio performance from sub $100, single-driver wireless buds. However, the MA650s proved able to punch above their weight class. The aluminum aerophonic housing is a unique design (RHA says it’s modelled on an inverted trumpet shape) that reduces reverberation and distortion. Employing a proprietary housing and combining it with the company’s own custom driver that takes advantage of the design clearly paid off. I found the RHA MA650 earbuds delivered an energetic listen. They could have used more low end and the high notes could get a bit bright. There is plenty of volume on tap, but when really cranked up I found that high end could transform from bright to harsh. Between tracks, some audio hiss was present, but it was not detectable during playback. These criticisms would be important in a set of $300 headphones but on wireless earbuds that come in under $100, it’s a little nit-picky. Overall, the MA650s offered an enjoyable listening experience while playing all genres of music. They also stayed reliably connected to my iPhone using Bluetooth, with no drop-outs. I did run into an problem where Siri stopped responding to the MA650 microphone –it would trigger using the remote button, but ignore commands. The mic would also be ignored during voice calls. Rebooting the iPhone resolved the issue, so I think the problem was on Apple’s end, not RHA’s. If you’re really serious about your music and want something with better audio performance, RHA’s MA750 wireless earbuds have a similar form factor, but step up to the company’s 560.1 driver and stainless steel housings for an additional $70. There are some compromises with neck band design of the MA650s. Unlike a pair of true wireless earbuds that lock firmly in-ear, this form factor in general isn’t ideal for all types of exercise. Running is fine, sit-ups not so much. I also found the inline remote a little difficult to use. Part of that was the large finger issue, but the position of the remote (less than six inches from one of the buds) was awkward, and there’s no way to tell which button is which by feel –you basically have to memorize the layout, or use the middle button to summon Siri (or Google Assistant) and use voice control instead. Over the years I’ve made no secret of the fact that I personally prefer the neckband form factor to true wireless earbuds (longer battery life, no worries of dropping or losing a bud, smaller buds and no wireless sync issues). The RHA MA650 wireless earbuds take full advantage of this design to offer impressive battery life. Unlike true wireless buds, these ones will last for an all-day hike on a single charge –no pauses without music while the buds recharge in their case. The aluminum aerophonic design of the buds themselves gives a premium look, and helps them to sound better than expected for the price. If you’re looking for wireless earbuds but are on a budget, make a point of checking out the MA650 buds from Scotland’s RHA Technologies. Disclosure: RHA provided MA650 earbuds for evaluation but had no input into this review.